Rovaniemi based Santa’s Santatelevision YouTube channel has doubled its viewers this year, with a goal of 100 million video views by the end of the Christmas season. Half of the viewers come from Latin America. Other important countries include France, Italy and Spain, and about 2% are Finns. The Santatelevision YouTube channel (www.youtube.com/santatelevision) is produced by Rovaniemi (Lapland, Finland) -based Joulupukki TV Oy. As with tourism of Rovaniemi in Lapland, Santa Claus YouTube channel is growing fast: Santatelevision has been viewed twice as much this year compared to last, and the pace is only accelerating as Christmas approaches, says Tommi Lappalainen, CEO of Joulupukki TV. By mid-December 2017, video views have reached about 70 million. This Christmas, the new videos on the Santatelevision channel introduce Santa’s reindeer dog and showcase the most beautiful letters he receives at the Santa Claus Main Post Office. 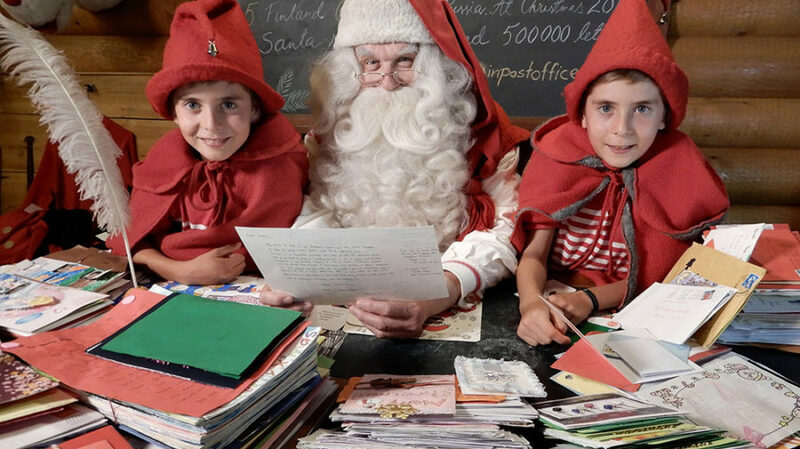 Santatelevision channel videos often take place in some of Rovaniemi’s Christmas holiday destinations, such as the Santa Claus Main Post Office at Santa Claus Village on the Arctic Circle. The most popular videos on the Santatelevision channel are the Santa’s video greetings and stories about his reindeer. The typical video is between 4 and 10 minutes long. Currently, Santatelevision has about 70 different Santa Claus videos, most of them localized in six different languages (English, Finnish, French, Italian, Spanish and Portuguese). The goal of the Santatelevision YouTube channel is to reach 100 million videos viewed by the end of the year. About half of channel viewers come from Latin or South America (Mexico, Argentina, Brazil, etc.) Other countries where the videos are popular include France (about 14% of viewers), Italy (14%), and Spain (10%). Finns represent only a couple percent of the video views overall. Santatelevision is one of Finland’s most international YouTube channels. According to the Socialblade network service, which specializes in YouTube channel tracking, the Santatelevision channel has a B+ rating. On a country-specific daily ranking list, Socialblade ranks the Santatelevision YouTube channel between sixth and ninth in Finland. The Santatelevision channel is offered in six languages: Spanish, French, Italian, Portuguese, English and Finnish. The channel was created in 2010 by Rovaniemi-based (Lapland, Finland) Joulupukki TV (joulupukkitv.com), established in 2000. The Santatelevisin Youtube channel has about 230 videos in different languages. Between 2014 and 2017, the channel’s number of viewers has grown yearly 70% to 100%. There are currently 130 000 subscribers to the Santatelevision YouTube channel. In addition to the Santatelevision channel, Joulupukki TV Oy production company offers, for example, video production and online marketing services to travel companies.